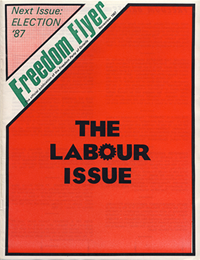 Freedom Briefs; Labour vs. Labour: The Truth Behind the Labour Movement; Freedom Party Trashes Garbage Strike; Profile: Ray Monteith; Delivering Our Message on the Postal Strike; U.W.O. Campus Strike; U.W.O. Union Certification Drive; Letters to the Editor; Letters on Labour. Contributors: Robert Metz, Marc Emery, Lloyd Walker, Greg Jones, Robert Vaughan.